The Jackson State Killings took place at Jackson State College (now Jackson State University) on May 15, 1970, in Jackson, Mississippi. Around midnight on May 14, city and state police confronted a group of students, opening fire on them, killing two students and injuring twelve. The Jackson State Killings occurred eleven days after the more widely publicized Kent State University Shootings in Kent, Ohio eleven days earlier. On May 14, 1970, around 9:30 pm, a group of African American high school and college students gather just off campus and began rioting in response to a false rumor that Fayette, Mississippi Mayor Charles Evers, the brother of slain Civil Rights activist Medgar Evers, and his wife at the time, Nannie Evers, were assassinated. Several white motorists called Jackson Police Department to complain about the African-American rioters throwing rocks at them as they drove by the campus on Lynch Street. The young protestors also started fires and overturned a dump truck. Seventy-five policeman and Mississippi State Police officers responded to the called, arriving to control the crowd. Around 12:05 a.m. on May 15, 1970, the police opened fire at the crowd killed four and wounded twelve. 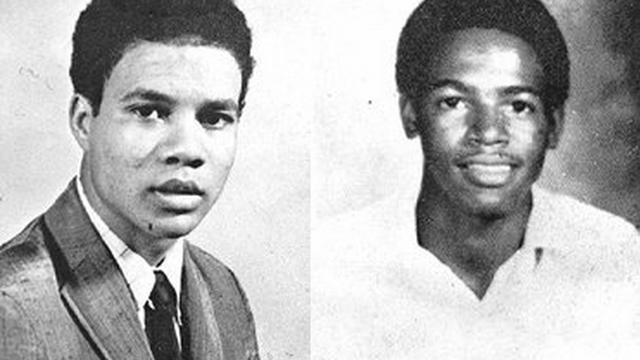 The two that were killed were twenty-one-year-old Phillip Lafayette Gibbs, a junior pre-law major at Jackson State and father of an eighteen-month-old son and James Earl Green, a seventeen-year-old senior at Jim Hill High School in Jackson, Mississippi. The reasons behind the police opening fire on the students continue to be disputed. Some students said the police issued a warning that they would shoot unless the crowd dispersed and when it didn’t, they opened fire. Others say however that the police abruptly opened fire on the crowd and on Alexander West Hall, a Jackson State dormitory, directly behind the students. Police claimed they shot at the dormitory because they spotted a powder flare on the third floor of the building and thus fired on the dormitory in self-defense. On June 13, 1970, the National Commission on Campus Unrest was appointed by President Richard Nixon to investigate the shootings at Kent State and Jackson State. The commission held its first meeting on June 25, 1970 in Washington, D.C. and then conducted public hearings in Jackson, Mississippi, Kent Ohio, and Los Angeles, California for thirteen days. During the hearings, the administration, faculty, staff, and students testified along with police and National Guard officials. Although the Commission criticized both police in Jackson and National Guard commanders in Ohio, no arrests were made in either incident. The Jackson City Council voted to close Lynch Street. The Gibbs-Green Plaza was constructed Alexander West Hall Center. The Gibbs-Green Monument, a permanent memorial to the slain students, is located in the plaza. “Jackson State Killings,” Nashville Public Radio, http://www.npr.org/templates/story/story.php?storyId=126426361; “Jackson State Killings, Libcom, https://libcom.org/history/jackson-state-shootings-1970; Tim Spofford, Lynch Street: The May 1970 Slayings at Jackson State (Kent, Ohio: Kent State University Press, 1988).